Blowzabella is a genuinely unique band that makes an inimitable, driving, drone-based wall-of-sound played with a fabulous sense of melody, rhythmic expertise and sheer feeling. They compose their own music which is influenced by English and European traditional folk music and song – a shared culture with ancient roots. 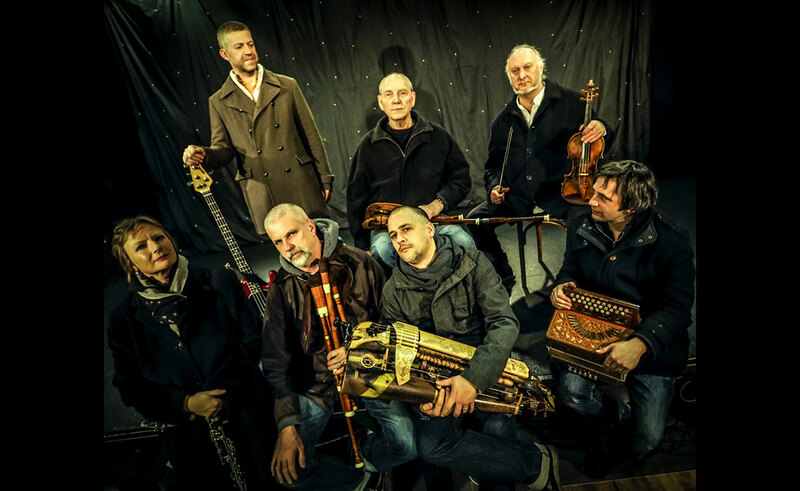 Blowzabella is Andy Cutting – diatonic button accordion; Jo Freya – vocals, saxophone, clarinet; Paul James – vocals, bagpipes, saxophones; Gregory Jolivet – hurdy-gurdy; David Shepherd – violin; Barn Stradling – bass guitar; Jon Swayne – bagpipes, saxophone. BLOWZABELLA celebrate 40 years of their joyous, drone-based noise with a new album ‘Two Score’, a new book of tunes ‘More Scores’ and gigs and festivals in the UK and EU.